This page is mostly made up of my photos of Amtrak equipment. Some oddball rolling stock and locomotives can be found here. To send me mail, click here. Click here to go to the Home Page. • Southmpton Yard in Boston - July 1997. AEM-7 906 in the Wilmington shops. AEM-7 927 undergoing a rebuild in the Wilmington shops. AEM-7 928 in South Station. AEM-7 944 in the Wilmington Station. AEM-7 951 (front) in the Wilmington Yard. Auto Train locos--P30CH's, and P42's. Dash 8-40BWH on a Hiawatha train - by Keith Schmidt. Dash 8-40BWH #508 on the Lake Shore. Dash 8-40BWH #518 on the Lake Shore. E60 #621's CAB in Wilmington. E60 #621 (side shot) in Wilmington. F40 Cab Control/Baggage Car on a Hiawatha train - by Keith Schmidt. F40 Cab Control/Baggage #90220 and 90214 in Rensselaer. F40 Cab Control/Baggage #90220 (rear) in Rensselaer. F40 Cab Control/Baggage #90220 in Rensselaer. F40 268, GP40TC 193, and MP15 536 by Rob LaMay. F40 356 and FL9 486 side by side at the Albany-Rensselaer Station. Genesis P32 #712 and F59PHI #459 in the Rensselaer shops. GP40TC 197 and FL9 486 in Albany-Rensselaer. The Genesis Page - P40's, P32AC-DM's, and P42's! The GP40TC / GP40H Page. GP9 #766 in Wilmington, DE. Auto Train Auto Carriers all over the Sanford yard (3 pics). Adirondack Baggage Car in Albany. Amfleet II Smoking Lounge (interior). Baggage Dorms--a smooth side and Corrugated BD. Business Car "Beech Grove" 10001 in Boston and D.C. (2 pics). Conference Club 9800 in Boston. Diner (Heritage)--( 3 pics - exterior of 8511, kitchen and interior) diners that are found on the Lake Shore Ltd.
Dorm Lounge #2503 (interior shot). Heritage Lounge 3111 and Heritage coaches (2 pics) on the Adirondack. A REALLY old Heritage Coach in Wilmington (Phase I paint!). Heritage 10&6 Sleeper #2440 in Altoona on the Three Rivers (Phase IV paint). 4 HiLevel cars on the rear of the Lake Shore. RailRoaders(2 pics) on the Lake Shore. Rail Roader AMTZ - 410014 on the Three Rivers -- By Bob Bishop. A Slumbercoach and 10/6 sleeping cars. 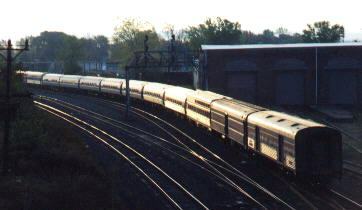 Superliner II Coach on the Auto Train. Acela Express 2031 in South Station. Amtrak train with an F40, 2 GP40TCs and a Viewliner added to the regular consist. By Brendan Kelly. Auto Train yard in '89 with Auto Carriers and heritage cars. Lake Shore Ltd. and the Empire State Express at the Syracuse, NY station at the same time! The Lake Shore Ltd #48/448 racing through Weedsport NY on a sunny day. The Lake Shore Ltd. nos 48/448 (fall 96) seen from an overpass. Lake Shore Ltd 48/448 (fall 1997)(2 pics) taken from an overpass. Lake Shore Ltd. exterior(3 pics) - pics taken from the outside the train. The First RTL III "Acela" Turboliner in Albany/Rensselaer (2 pics). Wilmington, Delaware Yard - showing E60s, an AEM7, and FL9 487. Amtrak Cab Control Car 9828 in Wilmington. Amtrak Caboose 14033 in Wilmington. Work Engine #721 in Wilmington. Work Engine #771 in Wilmington. RTL II Turboliner Nose Cone in Rensselaer.